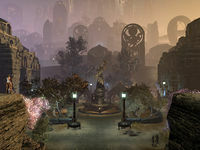 The Brass Fortress is near the center of Sotha Sil's Clockwork City, and provides safety for people from the dangers of the The Radius. Both are inhabited by Fabricants, Factotums, and people. Upon entering the Brass Fortress, one is greeted by a towering statue of Sotha Sil as well as an impressive skyline of the city with buildings towering to the sky. Around the statue lies a market square, the local inn, bank, and various other things that service the people of the fortress. To the north lies the Clockwork Basilica, where the Clockwork Apostles conduct their research. To the east side of the city lies the slums of Slag Town and houses the Tarnished and east of that lies the Machine District which contains the Fabricant production plant known as the Incarnatorium. To the west of the Fortress is the Reactor District. It contains the Asylum Sanctorum, used to seal the Dunmer Saints Felms, Llothis, and Olms as their clockwork vessels caused them to turn mad overtime. This page was last modified on 24 February 2019, at 11:06.